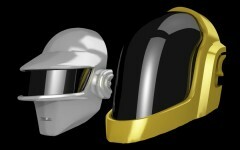 A client approached me asking for a pair of cufflinks resembling the Daft Punk helmets. This is what we came up with. For $200, I'll send you a pair as well! Or you could buy the parts and assemble them yourself.